On heathland near woodland (New Forest) with a flock of Redwings on grass this January. About the size of a Magpie. Long black tail, brown wings, blue / grey head / body. It was definitely not a Jay, nor a Jackdaw, I know my birds fairly well but have never seen anything like this one before. So, I have drawn it for you and your members. 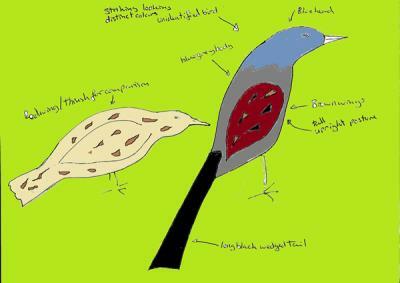 I'm no artist so - sorry that my redwing resembles a duck billed platypus. The drawing should be mainly used for colouration clues although my mystery bird does look a bit more like what I saw than the redwing does. 51 It occurs to me that your drawing suggests a 'Red Backed Shrike'.